When you cross the bridge, you will smell the ocean. The color of the bridge is difficult to tell…. It is not red. Brown is also wrong. Of course it is not yellow. It almost seems to be made of brick. If there were no rust every where, it would be really a modern style of bridge. But it is such an old bridge that it may have no choice. The bridge is on the way from Kochi-station to Sanbashi-dori, across the Kagami river and really close to the Pacific ocean. Every morning, lots of students cross the bridge by bicycle some fast and some slow. Some students look really sleepy, others looks really happy to see their friends. In rainy days, they cross the bridge with local train called romen-densha. After lunch time everyday, elderly people walk slowly across the bridge. Every evening, students also cross very fast so as to catch the train. I was also a one of the students. Before becoming a student, I had never crossed the bridge alone. I used to follow after my mother so as not to left behind when they went shopping at Obiyamachi or nichiyou-ichi by bicycle. Or I used to walk very slowly on the bridge with my grand parents to go the book shop while seeing cloud or the river under the bridge. The view from the bridge is changing day by day. Sometimes it is so beautiful, sometimes the river rises so surprisingly. It is so natural for me to see the unchanging view except for the cloud everyday. Everyone surely knows “the Harimaya bridge” because it is the most famous bridge in Kochi. The bridge is center of Kochi and it has a famous love story.In addition, it also mentioned in the lyrics of a song called “nangoku tosa wo atoni-site” which is known for the song of Yosakoi-bashi.On the other hand, “the Ushioe bridge” is not famous bridge and only people who have crossed the bridge know the bridge, even though the Ushioe Bridge has some Kochi’s famous scenes and it is more unique than the Harimaya bridge. The Ushioe bridge is the Bridge Nobody Knows and Nobody Care About, because it is common bridge for people live in Kochi. There are no song and special lighting, they may not feel moved. This bridge was built to connect from the center of Kochi city to the Kochi port in 1903. It was 130 meters length and 4.5 meters width. Furthermore it was made by 木鉄混合ハウ氏式橋 , and it was difficult to collect materials such as woods, iron, cement, and so on because it was so big. But brick was main material. It was so rare that the use of brick was the first time in Kochi. Three years later, trains ran the east of the Ushioe bridge side by side: this was also not famous bridge for trains. Of course, there were fewer cars than now. The Kochi station opened as the end of the line from Susaki to Kochi in November 15th 1924.The after the year the Harimaya bridge was repaired to 18 meters in width, and then neighborhood of the Harimaya bridge became the most popular downtown in Kochi. 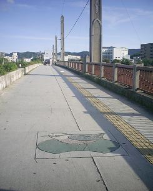 In 1928, because of opening the road from the station to ushioe-sanbashi, the Ushioe bridge was also renovated, and the line for romen-densha was set: a separte bridge for romen-densya was taken down. The Ushioe bridge finally completed in 1937. People cross this bridge because they have to go the opposite side to go shopping, work, drink with friends, and so on. But they don’t just cross this bridge like other common bridges. Baby and elderly not only see the view or cross the bridge but also hear the song of something from somewhere at both start and end. The sound is the song of the “Yairo-cho”, the prefectural bird in Kochi which has eight colors on its feather.It is extremely rare. For this reason, it is said to be “the most beautiful migrant in Japan”. In 1937, Yairo-cho was sighted in Kochi for the first time, and then become the Kochi’s prefectural bird in May 10th 1964. Because it migrate from China, Thaiwan and Korea to Japan. Shimanto-city is one of the cities which yairo-cho migrate. However,they live in the deep forest, so we can not see them easily. There are four speakers at each corner of the bridge. They were donated by “Kochi Takashiro Lions Club” (it is a volunteer organization in Kochi) on July 25th, 1989 as the 30th birthday of the club. You can hear the song of “yairo-cho”. In addition, there are also picture of Yairi-cho on the road at every corner. It was painted the same year when Kochi became a prefecture called “kokumin-kyukaken”. Therefore there are a lot of them around Kochi,especially near the Kochi castle, Outesuji, map, and so on. To tell the truth, some people did not realize this fact. I asked some people who live in Kochi and cross this bridge like student or elderly people. But nobody knew the lighting designed Onaga-dori, and they said “I wonder if there is lighting such as you say”. It seems that people who live in Kochi and always cross this bridge do not care about the lighting. Moreover, there are also other designs like flower or fish. Of course, however, most people do not realize this either. In Kochi, there is a book called “kochi wagamachi-hyakkei”. In 1990, this book was published to encourage to Kochi and has contains a survey of people in Kochi : What is the scenery of Kochi? The Ushioe bridge is one of them. In fact, it is just one of many bridges, but it is a little just different from other bridges. It is not so famous like the Harimaya bridge. However sunset from this bridge is so beautiful. Most of people never stop to see the scene, but they always see it and sometimes gaze while crossing. In every Spring, people see beautiful cherry blossoms near the bridge. I asked elderly parson who lives near the bridge for a long time “What do you think why does it have some unique ideas not like other bridge?”. She said, “I do not know the details. But it is obvious that it very near from center of Kochi city. Also it will be best position to see coming romen-densya.”. Actually there are some camera men who are waiting to take photos especially during the long vacation known as “Golden Week.” I asked city-hall the same question and about the details of this bridge, but because it was built so long ago, no one seem to know very much. It seems that nobody really knows the Ushioe bridge. Thank you so much for informing me of the history of this bridge; I must have crossed it more than a hundred times, yet knew nothing of its interesting past. Your article is very well written. Well done. I read your artical just now. I could learn a deep history of the bridge. Also,I can image of the bridge seeing some pictures. When I have some free time,I want to go there! I know the bridge. But I didn’t know the history of the bridge.Only I cross the bridge.It said that Kochi’s tourist attraction is Harimaya bridge.But almost all people is disappointed to see Harimaya bridge.So,I think the bridge is going to be Kochi’s tourist attraction!We can see the beautiful sun set,beautiful cherry tree and hear the song of river there.In addition, there is history of the bridge.So,tourist will be satisfied with Kochi,and the time they spend there. I’ve crossed this bridge many times, but I have never thought about its history. I didn’t think it is different from other bridges. But after reading this article, I got interested in it. This article is very interesting. Especially, the introduction attracted me .